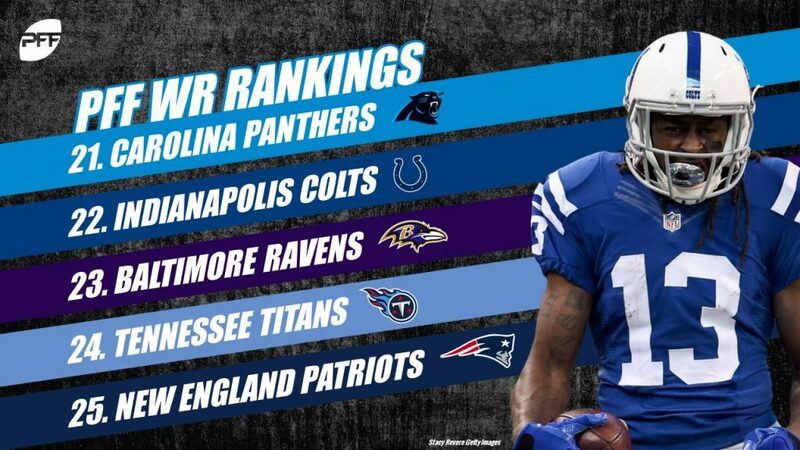 Now through Week 4 of the 2018-19 NFL season, we have come together to rank all 32 wide receiving corps in the NFL. 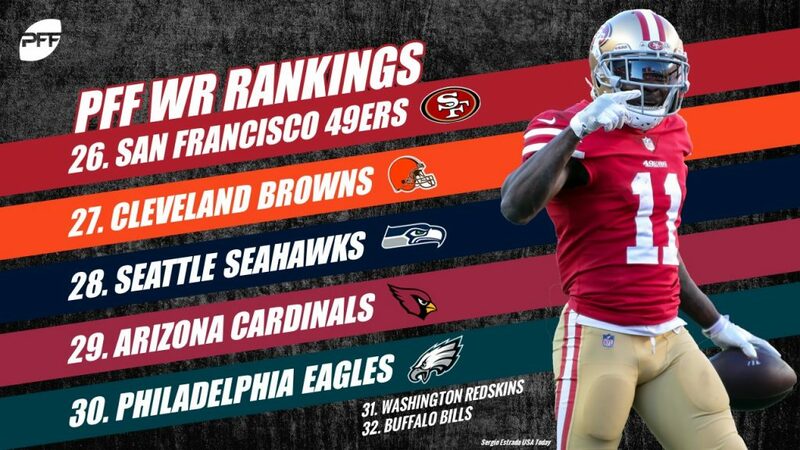 The ranks below pull from grades, advanced stats and more that each of the team’s wide receivers have generated in four weeks of play. 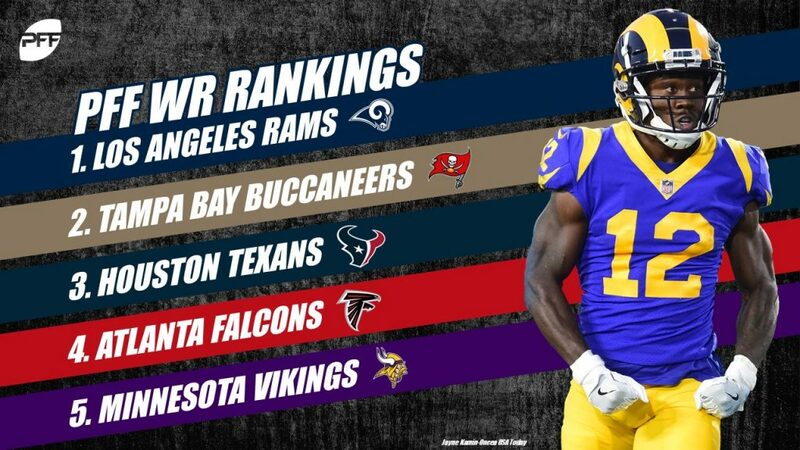 It should come as no surprise that the best team in the league with the best offense in the league also has the best wide receiver corps in the league through the opening month. Robert Woods (84.2) and Brandin Cooks (82.3) both have top-10 receiving grades, while Cooper Kupp (79.1) isn’t far behind at 20th. No team can match the 29 explosive plays generated by Rams’ wideouts on the year, a league-leading 14 of which have come from Cooks. Tampa Bay is home to three of our 10 highest-graded wideouts through four weeks, led by DeSean Jackson, whose 91.1 overall grade and 274 yards on deep passes both pace the league. Mike Evans has been doing Mike Evans things, hauling in an NFL-best nine contested catches. DeAndre Hopkins continues to be excellent with an 88.8 overall grade that currently ranks third among wideouts. What may be more surprising, however, is how well Will Fuller is playing right now. Fuller’s 86.4 grade sits one spot behind Hopkins and is up nearly 20 points from a season ago. He’s yet to drop a pass and has moved the chains on 14 of his 17 receptions. Much like the Texans, the Falcons have an established star in Julio Jones, who trails only Tampa Bay’s Jackson in overall grade (88.9) and yards per route run (3.46). They also have a young wideout establishing himself as a quality second option in rookie Calvin Ridley. And while Ridley won’t continue to convert 40 percent of his receptions into touchdowns going forward, his 75.3 receiving grade leads all rookie receivers so far and there’s little reason to believe the No. 1 WR on our 2018 draft board won’t continue to produce. Minnesota’s tandem of Adam Thielen and Stefon Diggs were a major reason the Vikings topped our list of best pass-catching units in the preseason, and they remain the reason the Vikings are in the top-five now. This group has produced 21 explosive plays (sixth) and forced 11 missed tackles after the catch (fourth). One thing dragging them down? Their eight dropped passes are tied for the most in the NFL, half of them off the hands of Laquon Treadwell. Tyreek Hill has done a little bit of everything for the Chiefs’ offense, averaging 2.79 yards per route run from the slot (fifth), picking up 135 yards on deep passes (seventh) and adding 148 yards after the catch (eighth). 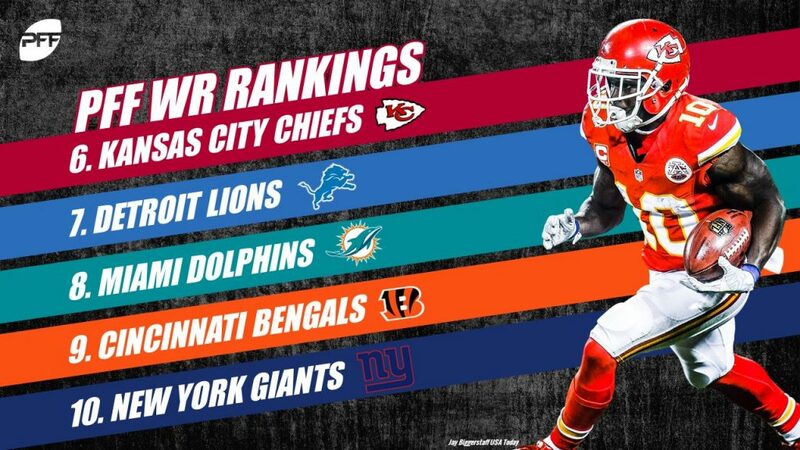 Sunday’s matchup between Kansas City’s “return specialist” and the Jaguars’ secondary is must-see television. Golden Tate continues to be an absolute monster creating with the ball in his hands, picking up 199 yards after the catch (second) and forcing eight missed tackles in the process (third). Second-year wideout Kenny Golladay has had an excellent start to the season, ranking among the league’s top-10 in both explosive plays (11) and contested catches (five). It’s truly been a team effort in Miami through four games, with four Dolphins receivers seeing between 14 and 18 targets and all of them earning an average grade or better. As a unit, they’ve averaged an excellent 7.5 yards after the catch per reception, nearly a full yard better than the next best team (Jaguars), while only dropping two passes. More and more teams are kicking their most talented receivers inside to the slot and letting them do work. That’s been the case with A.J. Green this season, who is on pace to get more snaps in the slot than he’s seen in the past two years combined. It’s been a fruitful exercise so far, as Green’s 4.76 yards per route run out of the slot is so far ahead of Saints’ Michael Thomas in second place that Thomas (3.23) is actually closer to Sterling Shepard (1.75) in 20th place than he is to Green. Giants wideouts have caught an NFL-best 97 percent of catchable passes, led by Odell Beckham Jr., whose 31 receptions without a drop are the most for a player at any position. Beckham has also forced multiple missed tackles in every game so far, 12 in total, the most for a wide receiver this season. 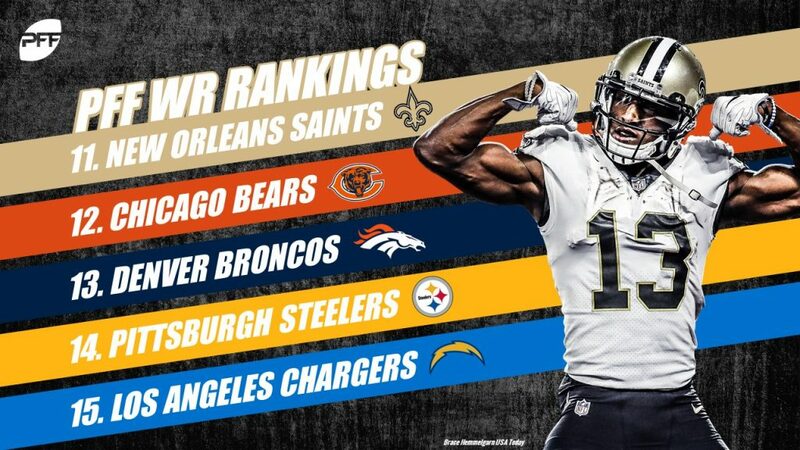 Michael Thomas is almost entirely responsible for the Saints ranking this high, as he has more targets than all other Saints wideouts combined. Thomas has remarkably caught 42 of the 44 passes thrown his way this season, giving him a 95.5 percent catch rate that leads qualifying receivers by a wide margin. The Bears’ revamped wide receiver corps has played well through the first quarter of the season, even if they’ve been somewhat limited by their second-year quarterback. Chicago is one of four teams to have just one drop from a wide receiver this year, which came at the hands of rookie wideout Anthony Miller all the way back in the season opener. Demaryius Thomas’ 67.0 overall grade is hurt by five drops, which is tied for the league lead. But Emmanuel Sanders has been able to pick up the slack, earning an 82.7 overall grade that currently ranks 11th. Sanders has hauled in all five catchable deep targets for 116 yards. It’s been an uncharacteristic start to the season for the perennially great Antonio Brown. Through Week 4, Brown’s 70.3 overall grade, while still good, would comfortably be the worst of his career in the unlikely event it sticks around for the entire season. That slow start is enough to push the Steelers further down this list than expected, even though JuJu Smith-Schuster continues to be a problem for defenses in the slot, where he’s gained a league-high 340 yards. Keenan Allen is off to a slow (for him) start with a 71.4 overall grade that ranks 35th. On the bright side, Mike Williams looks to be taking a step forward in Year 2 of his career. The contested catch monster out of Clemson is showing those same skills now at the pro level, where he has the fourth-highest grade when targeted in tight coverage this season. 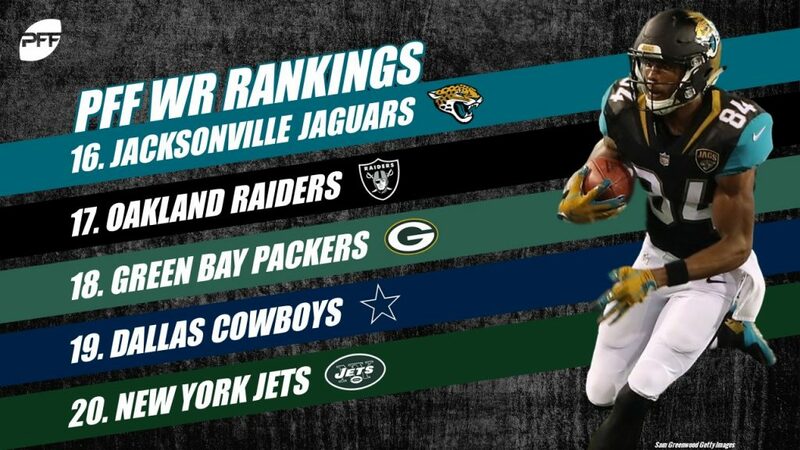 The Jaguars trail only the Dolphins in yards after the catch per reception this season, fueled largely by second-year player Dede Westbrook, whose 9.0 yards per reception is tied for fourth and has helped him earn the highest grade on throws targeted between one and nine yards downfield. We’ve seen good Amari Cooper on the drop front to start the season, as the former Alabama standout has dropped just one of his 23 catchable targets. As a unit, creating separation has been critical for the Raiders’ wideouts, as they’ve managed to pull in just 25 percent of their catchable targets in tight coverage, topping only the Cardinals. Green Bay is one of five teams with a league-high eight drops, but they’ve also done their fair share of playmaking with Randall Cobb (141), Davante Adams (127) and Geronimo Allison all topping 100 yards after the catch. However, injuries threaten to leave Green Bay without all three players in Detroit this week, which would force Aaron Rodgers to rely heavily on a trio of rookie receivers. Little was expected from this group entering the season, especially once the Cowboys cut Dez Bryant, but they’ve been solid through four games. Receptions haven’t always come easy for Dallas wideouts, as they’ve had a league-high 27 percent of targets be contested this season and trail only the Buccaneers in contested receptions with 12. Quincy Enunwa has been the clear bright spot for this group, earning an 81.8 overall grade that is tied for 14th on the year. No player has done more on throws targeted behind the line of scrimmage than Enunwa, as he has produced a league-high 96 receiving yards and converted six of his nine targets on those throws into first downs. The Panthers are in desperate need of a downfield threat at wide receiver, as they are the NFL’s only team without a reception from a wideout on throws targeted 20 yards or more downfield. T.Y. Hilton is still here, but very little has stood out about his play through four games, as his 64.2 grade currently ranks 62nd. As a unit, Colts wide receivers have been targeted just 9.2 yards downfield on average, the lowest average depth of target in the league. The bad: Michael Crabtree is tied for the league lead with five drops. The good: John Brown deep trails only Bucs’ Jackson with 243 yards on deep passes. On the heels of the best performance of his young career last week against the Eagles, Corey Davis looks to be making significant strides in his second year in the league. Davis’ 2.50 yards per route run is good for 11th among receivers so far after ranking 75th in the same stat a year ago at 1.14. No Julian Edelman and only 18 snaps of Josh Gordon through Week 4 means the Patriots have had very little to work with at the position. Big plays have been tough to come by, but in typical Patriots fashion, they’ve done a good job maximizing short throws by averaging the third-highest yards after the catch per reception (6.2). San Francisco’s best receiving threat resides at the tight end position. The group at wide receiver, on the other hand, has struggled to find any sort of consistency. Pierre Garcon is the only wideout to top 1.0 yards per route run after four games, and at just 1.1, he’s been unable to reproduce the sort of impact prior to injury last season. Marquise Goodwin established himself as the team’s No. 1 option in Garcon’s absence, but he has dealt with injury and has yet to record a deep reception after finishing 10th in deep receiving yards in 2017. What some were calling the best group of wide receivers in the league prior to the season (okay, it was really just one person) has been decidedly not that in the opening month. Gordon, of course, is no longer there, nor is Corey Coleman. Those who remain have combined to drop eight passes, which is tied for the most in the NFL so far. Injury has limited Seattle’s best receiver to just 61 snaps on the season, and while Tyler Lockett has produced some big plays by turning all three of his deep receptions into touchdowns, it’s largely been tough sledding for the Seahawks’ passing game. As a group, Seattle’s wideouts have forced a single missed tackle through four games, the fewest in the league. Big plays have been tough to come by for Arizona, where the Cardinals wideouts have generated just seven explosive plays, tied for the second fewest, and have averaged a league-low 3.0 yards after the catch per reception. After a breakout season in 2017 with his move to the slot, Nelson Agholor has been unable to reproduce that success so far this season. Agholor’s 1.00 yards per route run from the slot is nearly a full yard lower than last season and currently ranks 40th among 59 qualifiers. Washington wideouts have only dropped one pass this season. However, they’ve done little once the ball is actually in their hands, forcing only two missed tackles and combining for a league-low 79 yards after the catch, a total topped by 40 individual receivers so far this season. The Bills are home to the only other wide receiver unit to gain fewer than 100 yards after the catch and have produced league-lows in catch rate (74 percent) and first downs generated (13).